Zen- Archery and Zen- Meditation. The way of the Bow, as taught by Harry Mark, is not a competitive sport and marksmanship is regarded as relatively unimportant. The ultimate goal of Zen - Archery is to achieve a state of no mind at the time the arrow is released. Monastic retreat 2019: May 17.-19.; June 28.-30.; July 19. - 21.; 16. - 18. Aug.; 20. - 22. Sept.
Come and join me for a monastic retreat in the monastery Steinfeld. The monastery lies very close to Belgium, Luxembourg and the Netherlands, and is only 70 Km away from the airport Düsseldorf. 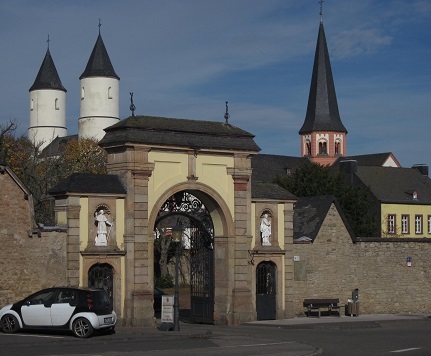 Transport from the airports Duesseldorf or Cologne / Bonn to the monastery in Germany and return can be arranged. Please contact me early if you require this service. Zen-Archery and Zen Meditation - Zazen and Kinhin. 2 nights accommodation in a single room at the monastery Steinfeld, in Germany, with full board. Bows, arrows, arm- and finger guards are supplied. Fee for the weekend: 440,- Euro, or 395,- Pound Sterling, or US$ 530,-. Phone: 0049 - 176 - 52 17 48 88. My name is Harry Mark.